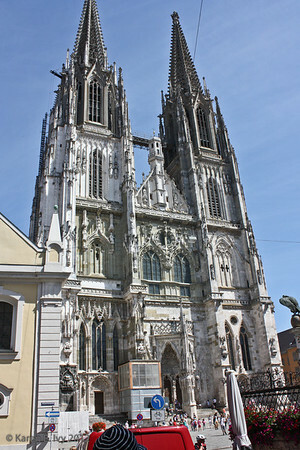 I forgot to mention that at Regensburg we saw the first really hot weather of the trip. Until then the weather had ranged from actually raining to partly overcast and cool. Walking around this town we were sweating; but it was a gorgeous day. 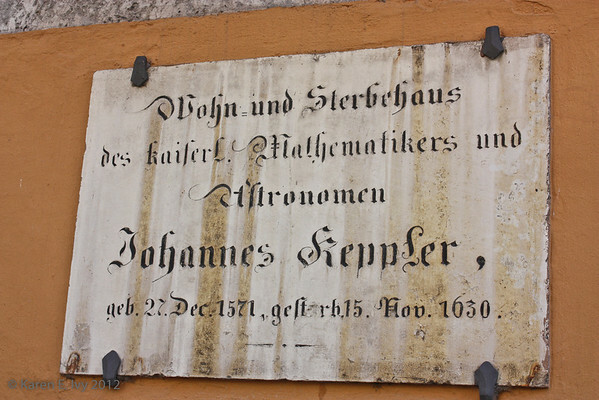 Kepler died in this house in 1630 on what turned out to be a short visit. We wanted to tour the house, which has been restored, but it was only open on weekends and holidays, and we were there on an ordinary Monday. 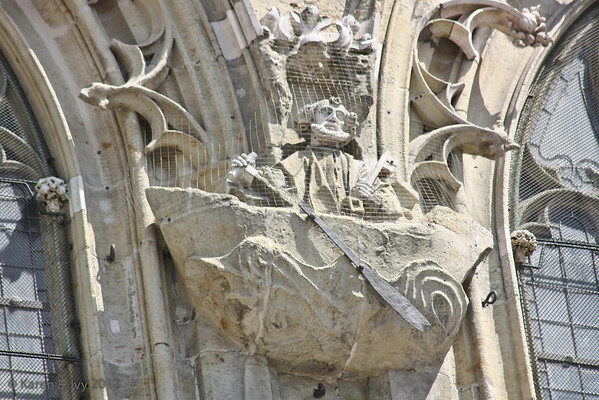 On the facade, I found a statue of St. Peter in a boat (the fisherman), holding a key (it’s usually a pair of crossed keys, the keys to Heaven). I like the waves on the side of the boat. That’s 1486 – the funny looking symbol in the hundreds place is half of an 8 – a 4. This was also the only church I remember seeing with a triangular entryway. 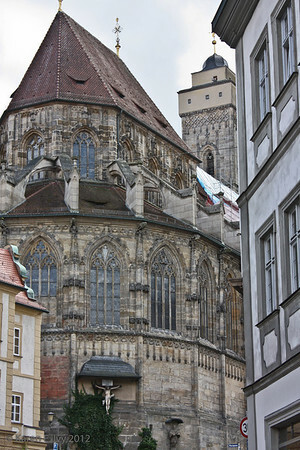 I didn’t see any explanation of why they did that, although a history of the Dom which I found suggests that the “atrium” was added in the 11th century – Regensburg has had a cathedral since the 8th century – and was included when the cathedral was rebuilt in mid-13th century, after one of the inevitable fires which plagued medieval structures. 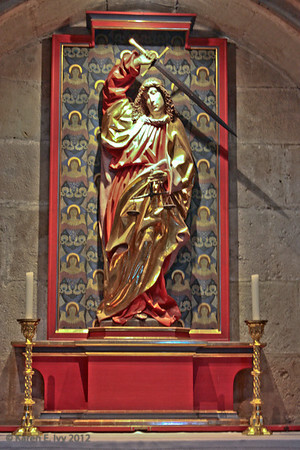 The nave has a large crucifix, with a statue of a praying man, at the head of the main aisle. 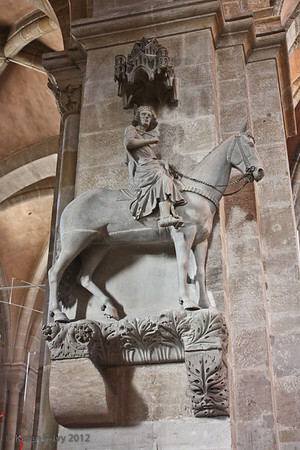 Like Bamberg, the Regensburg Dom has a statue of a horseman – in fact, it has two – but unlike the Bamberger Reiter there’s nothing mysterious about them, they’re just saints (I assume; maybe they’re kings) on horses. 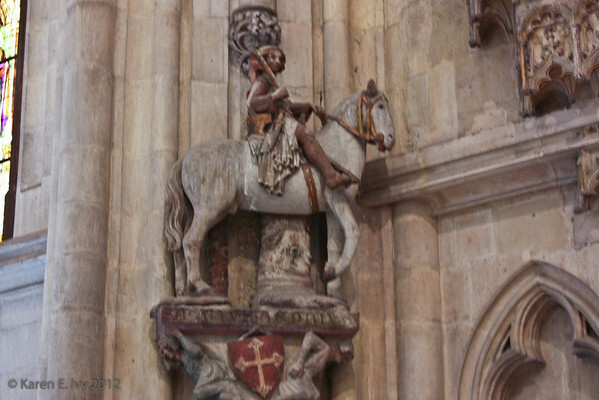 This fellow has an inscription on his pedestal, which I can’t read. 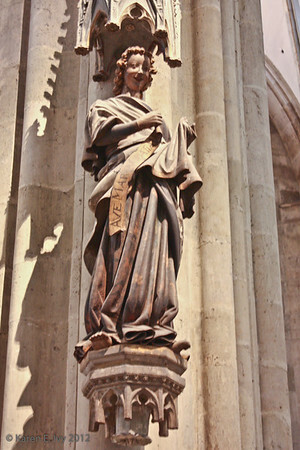 Regensburg does have a famous statue, though, the Smiling Angel, part of a group on the Annunciation. It took me 3 tries to get a reasonable photo of her; light levels in the Dom were worse the usual. The Smiling Angel is very popular. 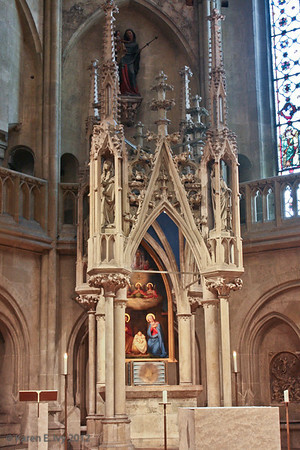 The Sailer Chapel is set aside for private prayer. 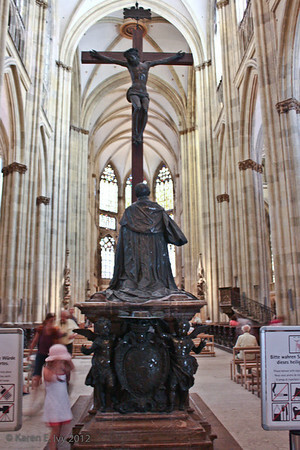 That isn’t a typo; it’s named for the tomb of Regensburg Bishop Johann Michael von Sailer (1751-1832), which was erected by King Ludwig I in 1837 in honor of his former tutor. 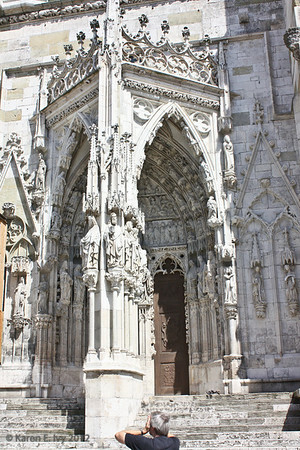 After touring the Alte Kapelle we walked back to the Embla by a route the tour hadn’t taken, and some of what we saw is in the Regensburg post. When we got back to the ship, I couldn’t find it at first. There is a shortage of dock space at the popular sites, and the cruise ships were literally docked 3 across at a single mooring. Fortunately I was able to identify Embla as the middle ship of three, because the ship facing the dock directly had a very intimidating sign: “Private ship. No trespassing.” Being a brash sort, I walked aboard anyway and asked how to get to Embla, and of course they said, walk on through. But I wonder how many timid sorts hesitated at that. After Nuremberg our next stop was Regensburg, which we approached on the Danube. The town is at the confluence of the Danube and Regen rivers. 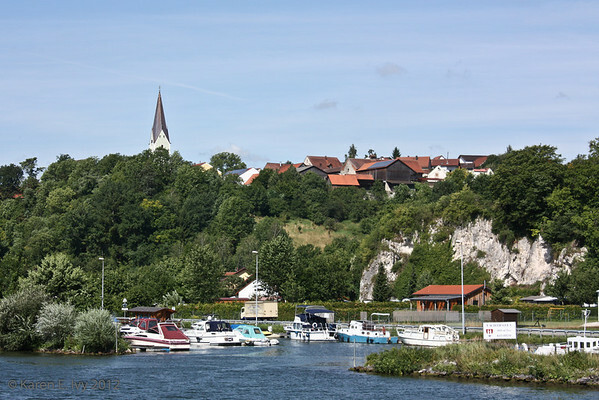 We moved out of the Main-Danube Canal into the Danube a couple of hours before reaching Regensburg, here’s a shot of a town along the Danube. I didn’t get the town name. 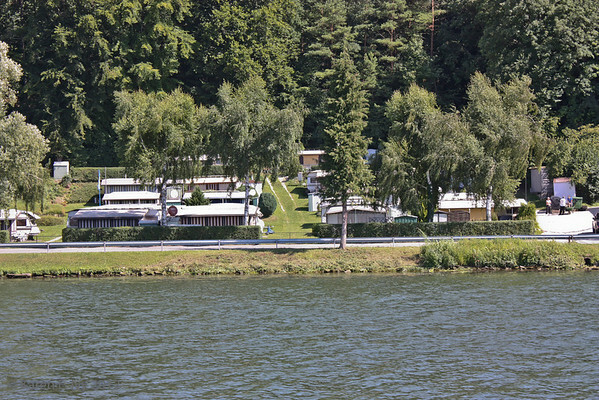 Apparently Germans love to camp by rivers in their travel trailers. Looks pretty permanent, doesn’t it? The banks of the Danube are just lush like this, all along. 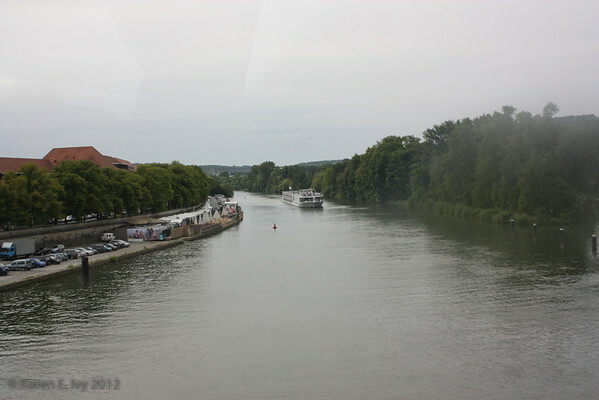 There are more Danube photos, and many more photos of Regensburg, in the Regensburg gallery on my SmugMug site. The afternoon of June 22, we toured Nuremberg. Nuremberg has quite a history, going back to the 11th century (see the linked Wikipedia article); but of course what we remember it for today is the huge Nazi rallies that were held there in the 1930s and 40s, and later the war crimes trials of the Nazi leaders. Read the medieval history, though, and you’ll see that the Nazis chose Nuremberg because it had been a center of trade and government for most of 800 years – the Imperial Diet of the Holy Roman Empire met there. 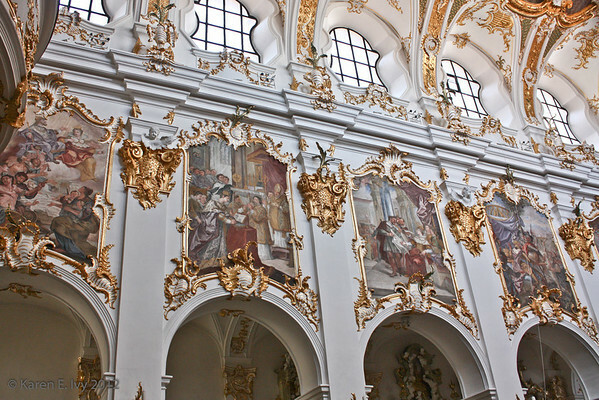 It was an independent “Imperial city” for many centuries but became part of Bavaria in 1806. 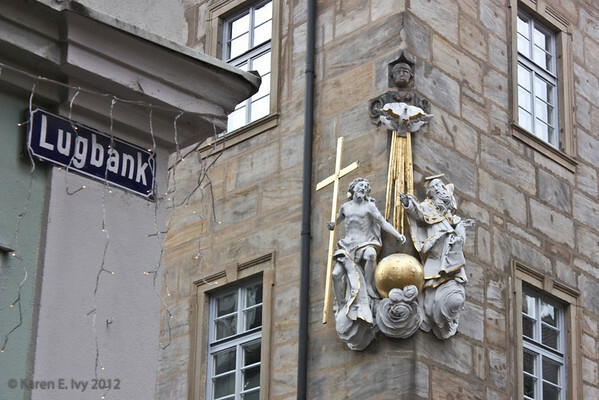 In my post on Bamberg and its breweries, I said that the Schenkerla brewery had a star of David hanging from the sign and I didn’t know why. 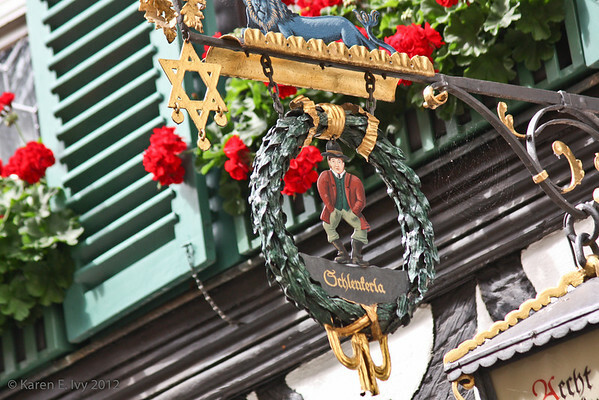 Jim said he thought there was something about that in Miltenberg, and I noticed that my photo of the sign for the Hotel Zum Reisen in Miltenberg also had a star of David hanging from the sign. But I didn’t have any notes on it. Footnote: for the record, I edited the link to the Museum of Beer and Brewing and corrected a typo. It should work now. After posting yesterday, I realized I’d left out the beer. Can’t do that. 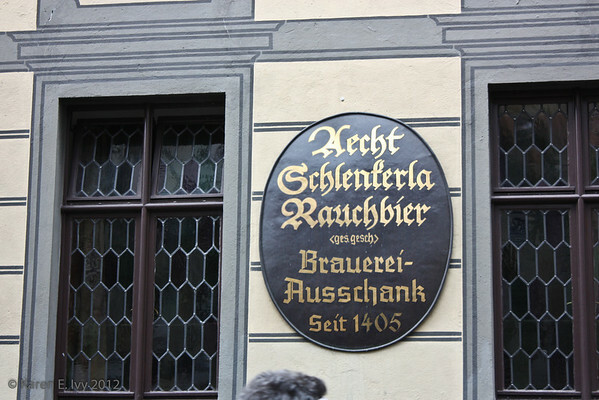 Bamberg is famous for its Rauchbier (aka “smoke beer”), “which has been likened by some first-time tasters to drinking ham from a glass. No, I didn’t taste it; even when I drank beer, I preferred a medium red ale. They roast fresh barley kernels over an open beechwood flame to make the malt. They’ve been doing this for centuries, as you can see from the sign below. Schenkerla did have an interesting sign on their main brewery site, I never heard any explanation of the star of David. In fact, I didn’t notice it until I looked at the photo. My notes aren’t clear but I think the priests who served in the Dom lived here. And remember, five stories, no elevator. 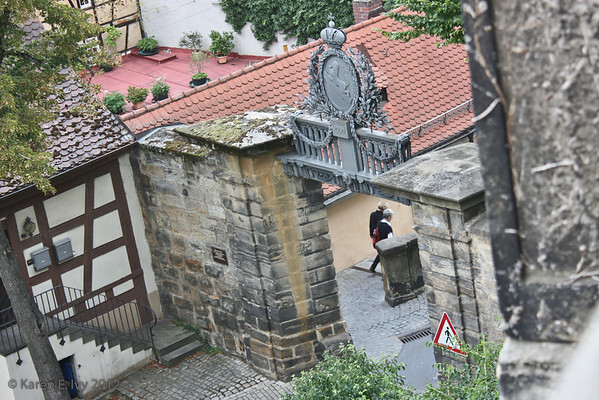 The courtyard of the old inn had a very elaborate gateway. You can see the banner for the celebration on the right. After our snack and garden stroll, we went into the Cathedral by the “Adam portal,” flanked by statues of Adam and Eve on one side, and Heinrich II and Cunigonde on the other. You can tell who is whom by the clothing. 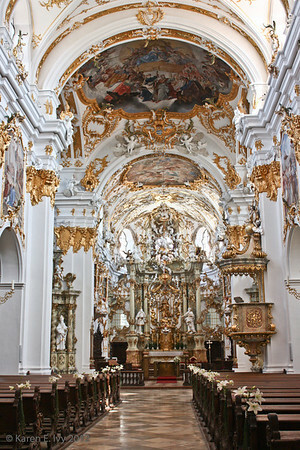 But we also got our second musical surprise of the trip, after the little fanfare in Miltenberg: as we walked into the nave, we heard a chorus, singing something that sounded like very early Baroque – Schütz, maybe. It was a delight, and we listened for a few minutes – and then the second chorus came in, above and behind us! You can see they’re in street clothes. 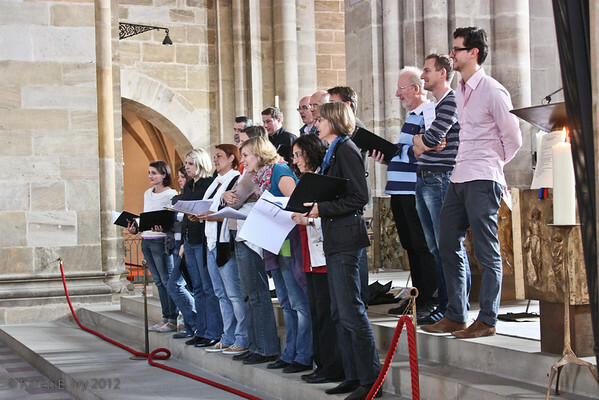 By scraping my extremely rudimentary German (fortunately I knew the word Sänger) against the almost nonexistent English of the nice lady on the information desk, I learned that this was the dress rehearsal of the Dom choral singers – the following day they would perform a concert, a thousand years of music in the cathedral. Before they closed the cathedral at 6 PM (much too early! 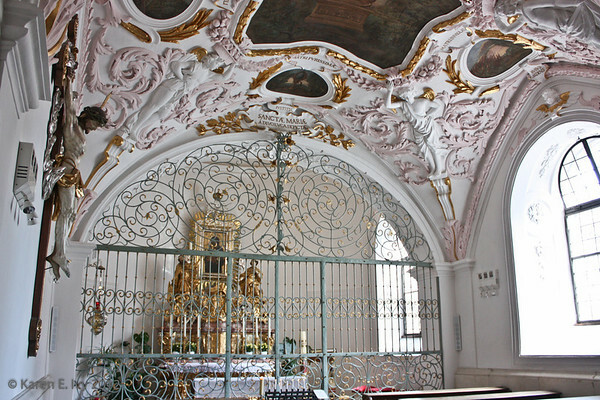 ), we heard them sing something that sounded like Josquin des Pres, and something that sounded much later Baroque, possibly Vivaldi or Telemann. 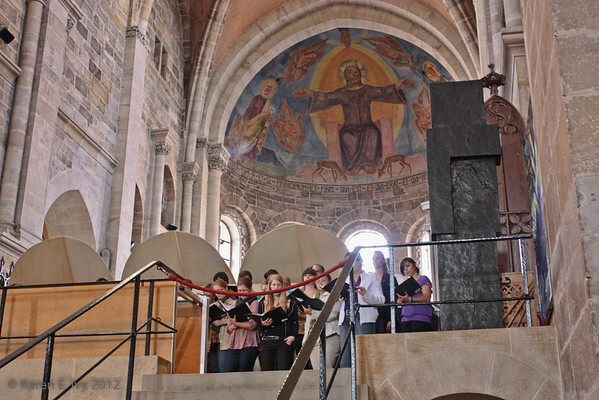 I considered it one of the best moments on the trip, to hear that music in the sort of cathedral it was written for. More delays in the blog, as we wrapped up the remodel, moved back in and unpacked everything. Almost everything. 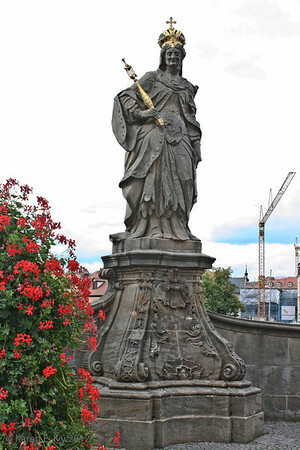 But I’m finally ready to go back to my vacation and consider our visit to Bamberg, the capital of the Holy Roman Empire under Emperor Heinrich II (that’s Henry to you) in 1007. Yes, that’s over a thousand years ago. 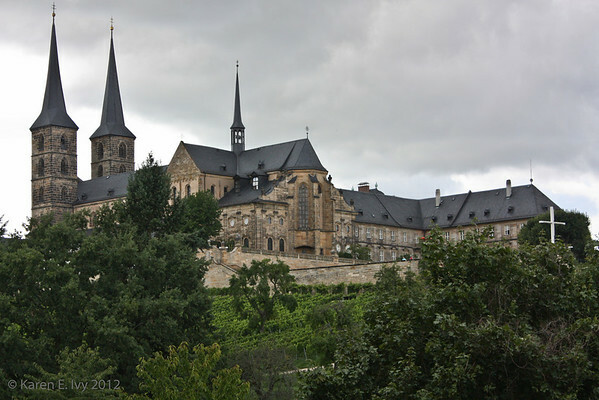 Heinrich chose to build Bamberg on seven hills, like Rome, with a church on each hilltop. It was also laid out in a cross, a standard medieval city plan, with churches at the cardinal points. 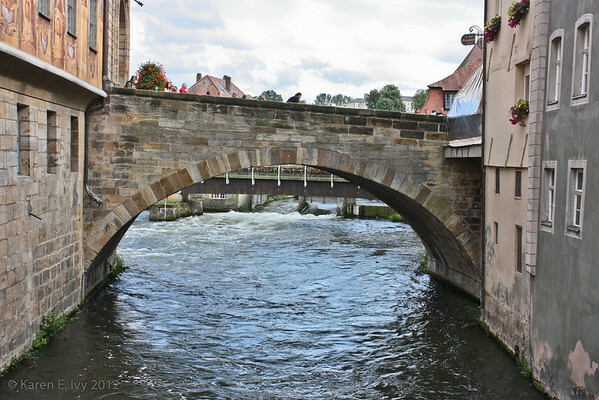 What I noticed first about Bamberg, though, was the rivers. 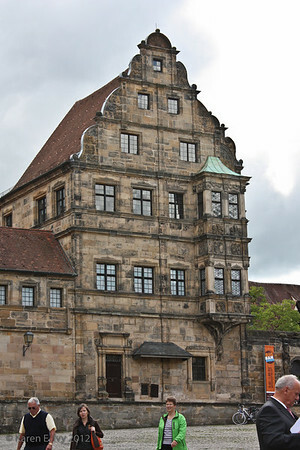 This is the Altes Rathaus or old city hall, which is on an island surrounded on both sides by the Regnitz river. As you can see from the eddies, the Regnitz carries a stiff current. If you think you see something sticking out at the bottom of the fresco, you do – it’s the leg of a cherub. The painters and plasterers who built the fresco thought it was funny. 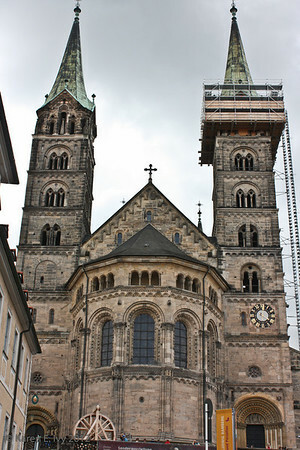 You can see closeups in my gallery on Bamberg. There’s one up under the roof, too. The bridge at the bottom is the Untere Brücke or Lower Bridge; I took the photo from the Upper Bridge. Here is the Upper Bridge, taken from the Lower Bridge. The force of the current is a little clearer here. The name is familiar to anyone who’s read Candide, or seen the Bernstein opera. As far as I can tell it was a pretty common name in medieval Germany. We spent most of our time in the old section, of course, but Bamberg has a more modern section too. I like the decorative rooflines. 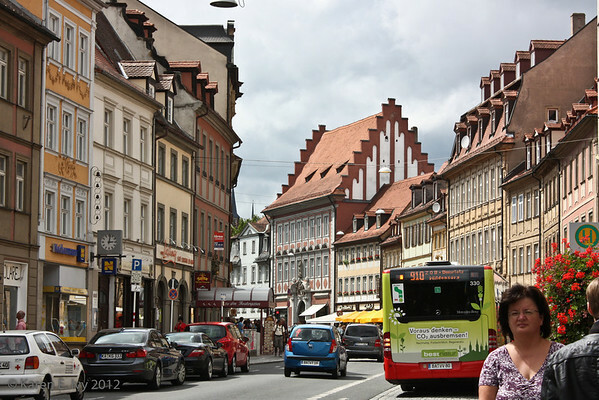 I notice most German towns don’t waste any space between their buildings. 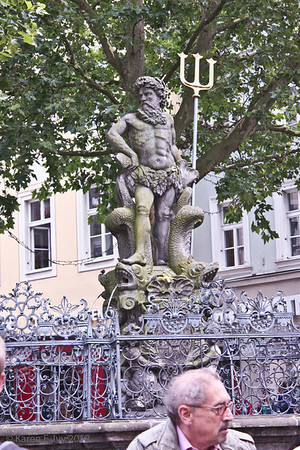 He is the landmark in the local Green Market, everybody meets “by the Gabelmann.” We did too, this was where we were told to assemble after our free exploration time, following the usual guided tour. We spent more time with the Gabelmann than we expected; I’ll get to that later. The one at the right, with the arches right into the water, was once a slaughterhouse. I don’t think we’d site one like that now. 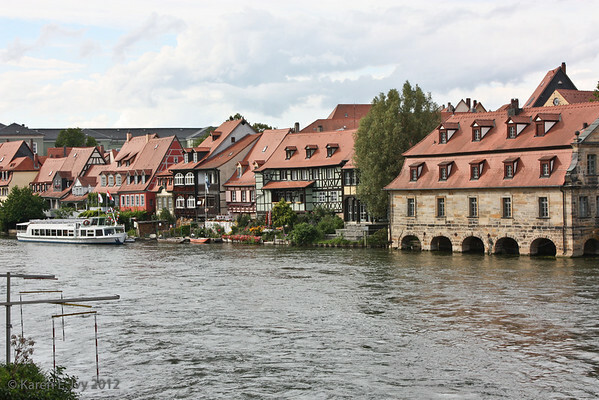 I also wonder how all those houses did when the Regnitz flooded. 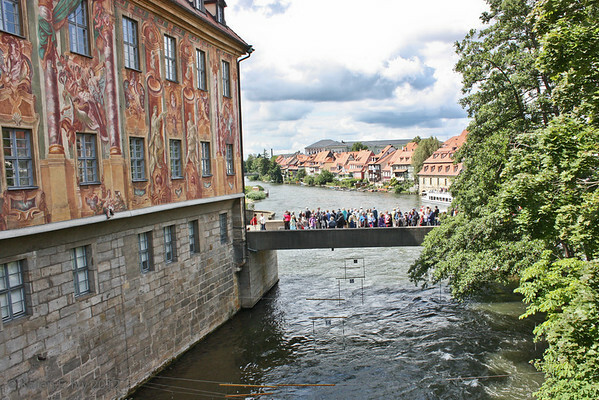 They’ve been there a long time, though – Bamberg is a UNESCO World Heritage site because it was not bombed in World War II and its medieval Old Town is intact. 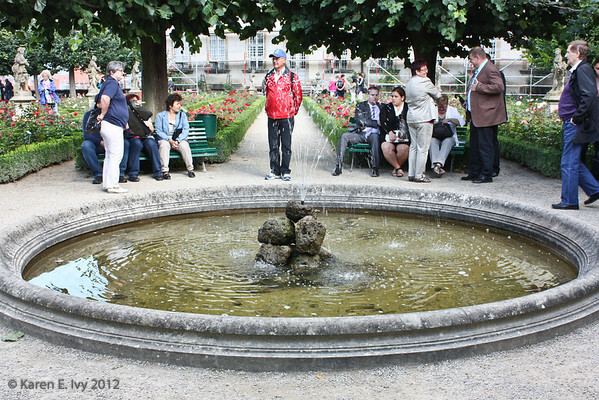 I found the Leschen Brunnen interesting – a Brunnen is a fountain. I don’t know what “Leschen” means. 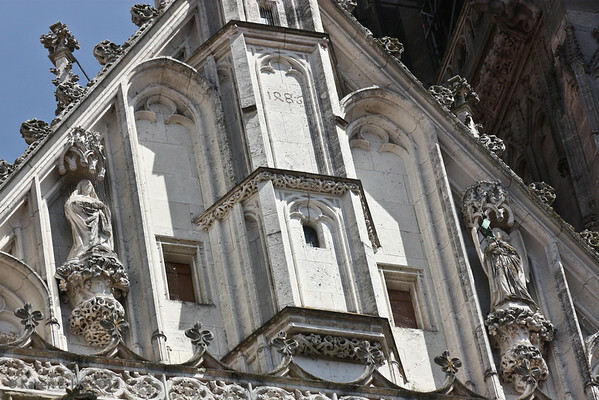 The sign, which isn’t very clear from this angle, says 1554. 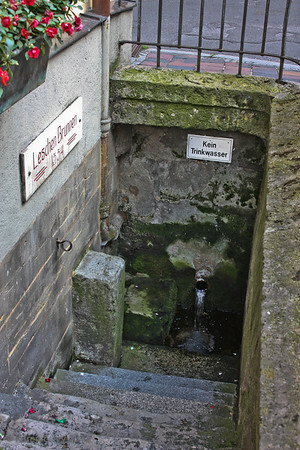 For the non-German readers, “Kein Trinkwasser” means, “No drinking water.” But I believe this was once a municipal well, you went down the steps with your bucket or jug to get fresh water. 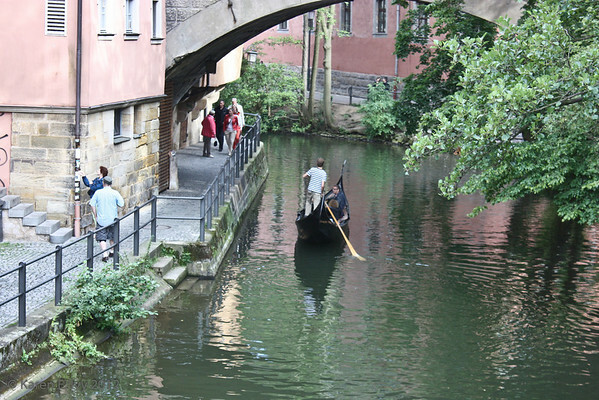 There are some quieter sections of the Regnitz, and they even have gondoliers. The riverfront is a very popular place. 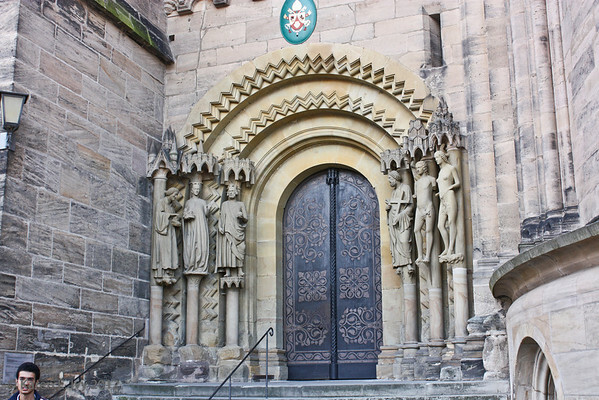 Since the Bamberg Dom was celebrating its 1,000th anniversary, I feel it deserves its own post. 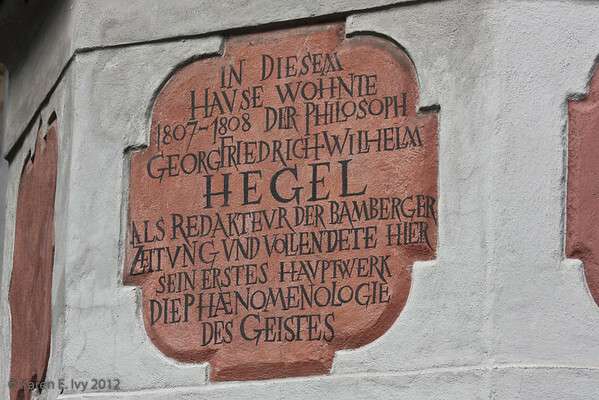 I’ll close this one with an account of our misadventure in Bamberg. We left the ship and boarded busses at 2:30 PM to come into town. We had the usual guided tour, followed by the usual free exploration period. They told us to meet at 6:30 by the Gabelmann (remember him?) to be bussed back to the ship for dinner at the usual 7:00 PM. 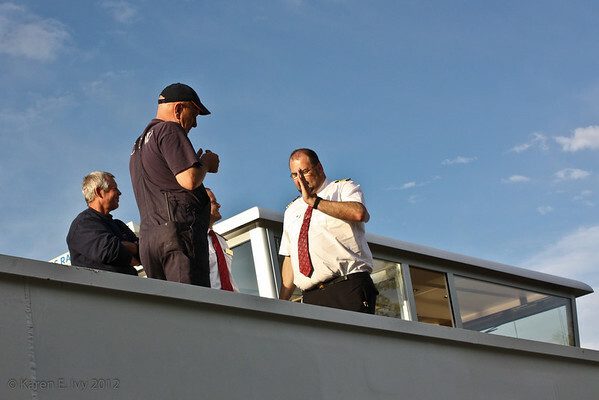 At 6:20 we were all sitting around, and Timea the tour director arrived with the news that the boat was queued at a lock. It had 2 ships in line ahead of it. (Remember The Day of Locks?) There’s nothing to do and no place to sit at the port, so she suggested we hang out in Bamberg until 7:10, when the busses will take us back and they’ll have dinner ready when we get there. Jim went off to explore the riverfront. I sat under the Gabelmann and read Great Expectations on my smartphone. (Yes, I did. My feet hurt.) Then she came back and said, go and wait in the busses; the lock has a problem. We never found out what. We eventually got off the busses in someone’s driveway, and walked down to board the ship at the edge of the lock approach. That’s the captain leaning on the white support. 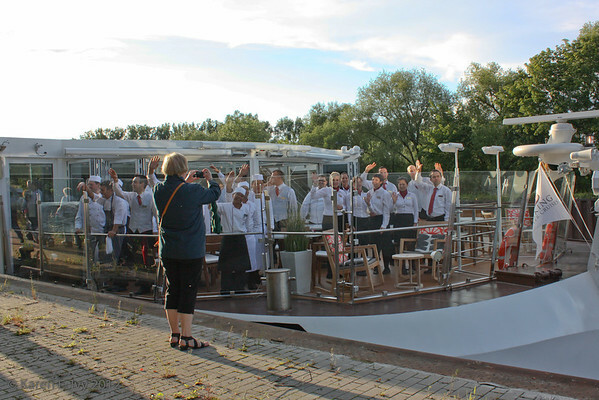 I was touched that the whole ship’s complement turned out on the deck to welcome us all back – I wasn’t the only one who took a picture. I stopped blogging for a while so I could go through my remaining photos and identify the subjects before I forgot every detail of the trip! It’s awful how fast things slip away. 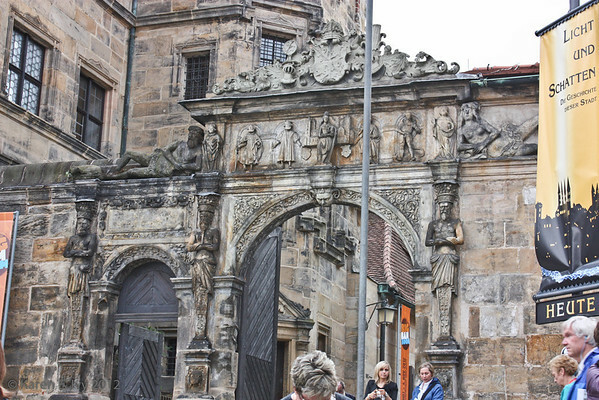 With everything now identified, I pick up the tale at July 20, the day we toured the Würzburg Residence in the morning and drove to Rothenburg op der Tauber in the afternoon. It’s also the day I assumed wrongly that it wouldn’t rain, although the day started out (as you can see below) very overcast. 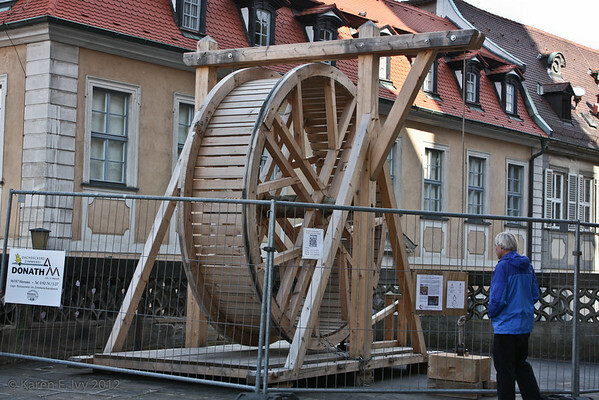 The full gallery of this day is at Würzburg and Rothenburg. Our tour of Miltenberg, a beautifully preserved medieval village on a bend of the Main, began about 15 minutes late, not bad considering how much time we lost getting through the locks. Here’s part of Miltenberg, showing the remains of the castle. Our travel notes suggest that Miltenberg was pretty well settled here by about 1379. It’s located in what’s called the “Main Square” or Mainviereck, where the river, in about 80 kilometers, makes two right angle bends. Miltenberg is on the first bend, a very strategic spot for collecting tolls. 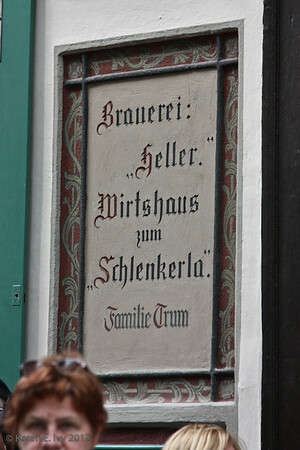 It still contains an inn that’s been in continual service since the 14th century and is the oldest pub in Germany. 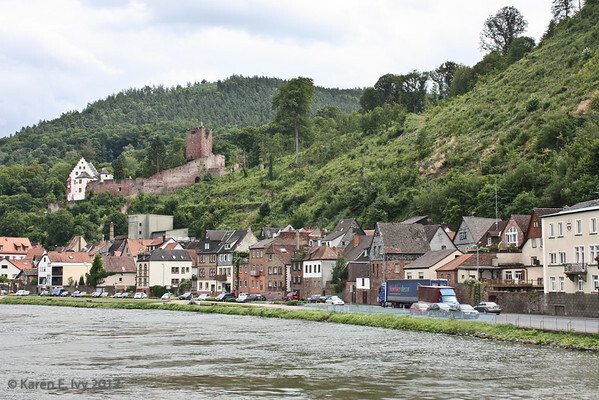 They also note that Miltenberg flooded a lot over the years – you can see how it might. Cologne may have been bombed flat and reconstructed, but the Allies don’t appear to have done Miltenberg any significant damage. We toured the town you see, on the right bank (as we went upstream); Miltenberg now occupies both banks and has a population of about 10,000. July 19 was the day we found out about locks – river locks, that is. We had been on the lower and middle Rhine, which have no locks; we went through one lock in the delta, and that was it. It scared me to death, too – it was sometime around oh-dark hundred, and the ship (which was previously as stable as the hotel in Amsterdam) suddenly lurched and clunked. It woke me up, and being an anxious sort, I was afraid we’d hit something. I got up and peered out the window – and saw a concrete wall less than a foot from the side of the boat, and a brightly lighted (deserted) collection of industrial structures. I was now awake enough to realize we were in a lock, and I went back to bed. 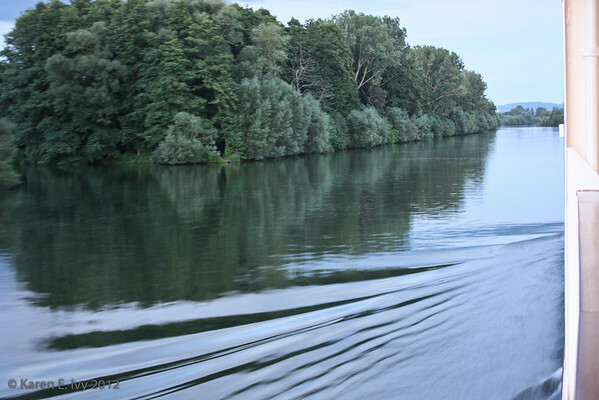 The Main is a much smaller river than the Rhine; the banks are closer and more rural, and the whole thing feels cozier. And it swarms with locks. We entered the Main just before midnight the 18th and went through 4 locks in the course of the night, three of which woke me up. Viking had a careful agenda made out, starting with a glassblowing demonstration in the lounge at 9:30, by a man from Wertheim. At 9:15 or so we arrived at a lock, and discovered that it was occupied by a boat coming in the other direction. I want to pause in my mad posts of photos, and just discuss the cruise a little. I've been on cruises before, and they're all different. On this one, not only was the ship brand new (this was its first formal cruise after it was launched), the crew were all brand new, not just to the ship but in many cases to Viking. They were very polite and very efficient but, for instance, one afternoon they advertised a "tea," and when I arrived at it and asked for a cup of tea, they said I could fetch it myself from the self-service bar, they were only serving coffee, because the program was to show the types of coffee! (I fetched one cup myself and got a second one delivered, which I call a draw.) I have no complaint about the service, though. 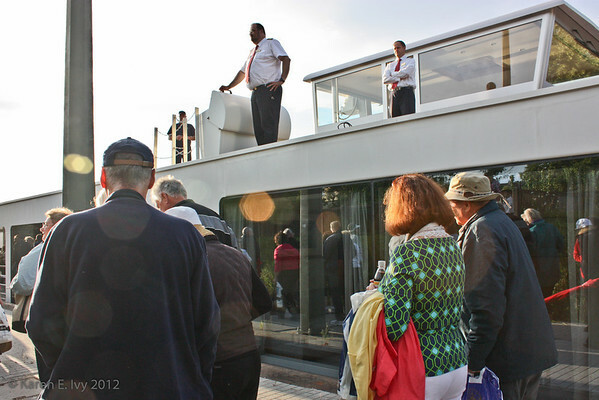 In fact, cruises like this are extremely hypnotic because everything is done for you – the food cooked and served, the bed made (and turned down), all the cleaning done when you're off having fun. The programs sometimes suggested what Germans thought Americans might like (the passengers were largely American, with scattered Canadians and Australians), without actually knowing much about Americans. The program one evening was labeled "food customs," in which the program director (who was Hungarian) gave a long talk which I would summarize as, "We Europeans dine in a more civilized way than you barbarous Americans." I called her on it the next day and suggested that most major American cities have restaurants in which one can have quite as leisurely (and expensive!) a dining experience with friends as she described! The same night they had a classical music program, with a very talented local trio (piano, clarinet, cello), who began playing light classical music but morphed into "easy listening" – Jim walked out when they started Moon River! The cruise offered a daily Qi Gong session, at 7 AM; I went to it about half the days, it was a nice way to start the day, stretching and breathing. It had about 4 regulars and another 4 or 5 who came occasionally. The ship advertised "free wi-fi", and they had it, but the devil is in the details. With a moving ship, of course, the wi-fi had to be satellite, which meant that connectivity was iffy when we were moving. On the other hand, if we parked under a large bridge, as we did in Cologne, connectivity might be non-existent. So I connected every couple of days, and basically spent only enough time online to delete spam and respond to absolutely critical emails. I did not go on a cruise to stare at a computer screen!